Carl-Thure Storme was born on New Year’s Day of 1894 in what was then called Moodyville – but known to us today as the Lonsdale Quay neighbourhood of North Vancouver. 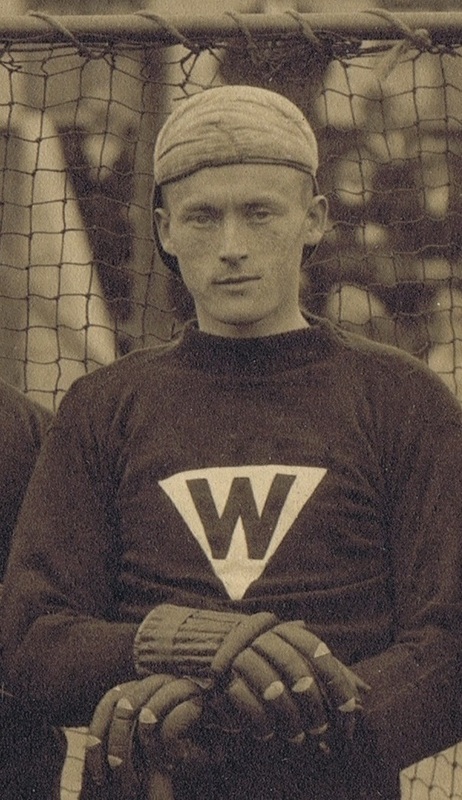 In his youth, he played junior lacrosse for the New Westminster West Ends between 1910 and 1912. He the joined the senior team in 1913 with whom he played the next three seasons. Storme went overseas in 1916 while the First World War was raging across Europe. He returned home to New Westminster as an invalid from a permanent right-arm injury. On his return, he managed to persevere and resume his lacrosse career in 1919 with the New Westminster seniors. Thure Storme became a pro lacrosse player for the New Westminster Salmonbellies in 1921. After playing his first season as a substitute, the Dane effortlessly settled into the scoring role vacated the following year by the legendary Gordon ‘Grumpy’ Spring. During his short, four-season pro career he led the Salmonbellies in goal-scoring in 1922, 1923, and 1924 and finished either second or first for goals in the league during those same years. He only played in 44 games but managed to bag 50 goals and 4 assists to finish 10th overall in career scoring and goals in the West Coast pro game. He would later resurface in the box game when he played the 1934 season with the New Westminster Adanacs at age 40, scoring 6 goals in 7 games. Outside of lacrosse, Thurne Storme was accomplished in many athletic pursuits. He held many track records won in high school and YMCA track meets – in events such as the quarter-mile relay, high-jump, and hop-step-jump. He was a soccer player with the (New) Westminster United and (New) Westminster Rovers teams for three seasons between 1913 and 1915. During those same years, he was a star basketball player with New Westminster high-school and YMCA teams who completed against teams from south of the border in Washington state. After the war, Storme continued to play soccer in 1919 and 1920 until a broken leg finished off his soccer career. Strangely enough, he managed to continue playing lacrosse and made the jump to the professional game once he recovered. His war injury did not get in the way of his baseball career as he was a southpaw pitcher with the New Westminster Pastimes club in 1919. He was talented enough to land a spot in 1926 with an unidentified semi-pro baseball team in San Francisco – allegedly pitching 37 scoreless innings. Thure Storme was inducted into the Canadian Lacrosse Hall of Fame in 1971 and passed away four years later.